We enter a beautiful hotel lobby reminiscent of the Disney California Adventure’s former Tower of Terror. A strange bellhop greets us in a rather robotic manner. Upon approaching the desk we are warmly greeted and asked for our IDs. Several minutes later we are handed a very professional looking passport. To the right of the desk stands a counter that serves sandwiches, salads and drinks. Many comfortable couches are scattered about the lobby and the second level. The wheelchair specific lift to the second floor next to a backdropped photo op look a bit out of place, but it’s forgivable because their purposes are so clearly important. Postmodern Jukebox rings throughout the building adding to a fun but slightly creepy environment. This lobby sets expectations high even if you haven’t watched the incredible marketing videos before arriving. Unfortunately the Agent Room isn’t quite as spectacular as the lobby, but it is a lot of fun. The decor is good. I honestly expected a bit more from it based on the amazing lobby. There are zip ties holding a few things together that seem a bit more functional than decorator choices. I’m usually not a fan of war themes, but this one was quite fun. I felt transported to a different time, maybe because I would never expect to find swastikas on anything these days. I couldn’t tell you the story primarily because I couldn’t hear the video that explains it over the loud music meant to set the tone. There is very little tech in the room, but what is there worked properly. 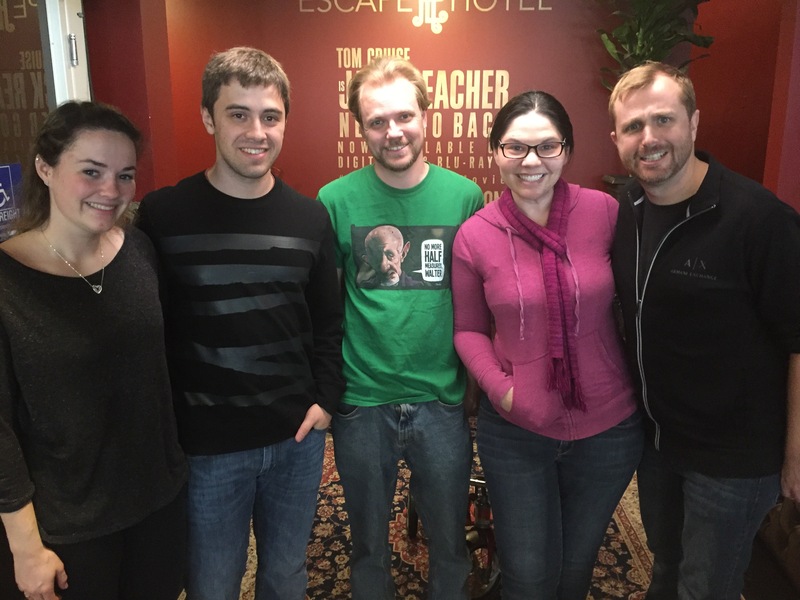 It is very much your typical well-done escape room. I liked one of the puzzles near the beginning because it felt very MacGyver and I hadn’t seen it before. The room bottlenecks near the end, but up to that point there seemed to be enough to keep all six of us busy. If you are sensitive to violence or historic war visuals, this may not be the room for you. Also be aware this is right smack in Hollywood, so arrive early to find parking and deal with unexpected traffic. Overall my husband and I had a really good time. We went opening weekend, so the company is still going through some growing pains of a brand new business. I expect amazing things from them in the near future, but until then The Agent is the room I recommend at Escape Hotel.